David is coming to New Who for the first time, having loved Classic Who as a kid. Tehani is a recent convert, and ploughed through Seasons 1 to 6 (so far) in just a few weeks after becoming addicted thanks to Matt Smith – she’s rewatching to keep up with David! Tansy is the expert in the team, with a history in Doctor Who fandom that goes WAY back, and a passion for Doctor Who that inspires us all. We’re also joined today by guest viewer Joanne Anderton, who is also discovering New Who for the first time! We’re working our way through New Who, using season openers and closers, and Hugo shortlisted episodes, as our blogging points. Just for fun! So, this feels like a bit of a cheat really, but the finale of season three is actually three linked episodes, so that’s how we’ll review them! First up, JACK IS BACK! Woo! I had forgotten that he and the Doctor actually have a conversation about why the Doctor deserted Jack after he was killed and made immortal. In fact, there’s a lot I’d forgotten about the conversations in “Utopia” – there’s actually some quite revealing things said, which are important to both hindsight and for setting up what’s ahead, which was pretty cool second time around. I am watching this live with Tehani in my living room! Sorry, David. Obviously you need to come visit us too. Haha maybe next time we need to skype or something. My honey is lecturing us on how far away the heat death of the universe will be, and suggesting that the Doctor has got his sums wrong. Surely not! Doctor Who science implausible? NEVER! It’s vaguely reassuring to know that even trillions of years in the future, actors from the Bill will be showing up in the human gene pool. I remember the first time I saw this, I was so ready to see Jack return and his confrontation with the Doctor who so coldly abandoned him two years ago, especially after the angsty season one of Torchwood and the dizzying joy of that end of season cliffhanger. Possibly a good point to ask: have either of you seen Torchwood season one? I think this episode will be experienced differently if you have or not. I do think the fact that Martha is new to Jack allows it to work effectively each way. I hadn’t seen it first time around, but have since glommed all the Torchwood! And I definitely agree, it adds a dimension it didn’t have before. I haven’t yet, however this three-parter has made me curious enough that I will have to go and watch it now. You need to watch it David, you MUST! Having Jack back is so revealing of the Tennant Doctor. You can see that there are many layers of tension there. Jack has waited more than a hundred years for this meeting, and the Doctor is kind of bitchy to him. Mean! As you can tell this story is mostly about the main characters for me, and their banter. I’m not really attached to the other future humans. I do love the scene where they have to show their teeth to get into the camp, though – an unexpected moment of funny in between all the angst and anger. Jack’s incorrigible, habitual flirting and the Doctor’s response to it is another funny bit for me. It’s quite cute actually! I was actually expecting to hate the whole reunion thing, but I thought the chemistry was really good. Part of that was that, as we have talked about many times before, I much prefer the three person dynamic, but we had that before. It also throws into sharp relief the differences between Ten and Nine. He is much more … centred, if I can use that term, or at least definitely more adjusted than Nine who was incredibly damaged. Ten is much better at keeping Jack on a leash! I did think the Doctor was being a bit nasty, and that is was a jealousy thing, but the idea of Jack being something against nature, something that offends Time itself and therefore the Doctor, neatly explains that. It’s a very clever little conversation they have about it actually, with its extra meaning! The reveal of the hand in the jar is one of my favourite scenes in this! And oh, the look on Jack’s face when he has to admit that he’s had it all along, countered with Martha’s disgust and outrage. Do you get the feeling that Jack has been reading all the Jack/hand slash on Torchwood fansites? One of the lovely things about these episodes is the way things tie back and draw together. Not just Jack, but little flashbacks and throwaways about past events of New Who. Nicely done I thought. And the references to Rose, which Martha loved! Bleh, I hate the way they always edit in one of those ‘oh the blonde’ moments in practically every episode. So overdone. The idea that there has to be a rivalry between Martha and Rose really bugs me. Still. Always. I do like that they remind the audience of Jack’s love for Rose, and how he’s been quietly mourning her all this time – I really liked the odd relationship they had, where they were attracted and flirty, but both basically slightly more into the Doctor than they were to each other, and NO JEALOUSY because obviously he was pretending to ignore them both. Man, I could have watched three seasons of Nine/Rose/Jack. I have a feeling that there’s a lot in this triplet that you two, as fans of Classic Who, will see that I won’t. I don’t know about the Master and his relationship with the Doctor, so I imagine there’s nuance and history that will affect your viewing. One particular point for me was the drums – is this something from Classic Who? It seems like a really important part of who the Master is. You’d think, wouldn’t you? And yet this was the first we heard of the Master’s incessant inner drum beat, and his deep and abiding obsession with Rogue Traders. It works brilliantly, but it’s one of those things where it doesn’t quite make sense if you look at it, and the classic series, too closely. I want someone to make a fanvid of Roger Delgado and Anthony Ainley rocking out to Voodoo Child though. What am I saying, that MUST already exist. Right? The character of the Master was fabulous. I really liked Professor Yana (even second time around, when I knew what he was!) but the Master was like, well, I guess he’s like the Doctor on crack! He’s quirky, he’s insane, and brilliantly charismatic. A great counterpoint to the Doctor! Casting Derek Jacobi was a great accomplishment – I’m only sad we didn’t get him for longer, especially when he became the really evil Master. The slow reveal of Professor Yana is a great aspect to this story, and it does make me wish I hadn’t been spoiled ahead of time as to who he was really. So I had no idea Derek Jacobi has actually done some Doctor Who tie in stuff until I looked him up – he’s already BEEN the Master, among other things! So cool. Tying the Professor Yana reveal into the watch from “Human Nature” was so clever, a very nice touch which allows Martha and the audience to realise the connection in the same moment … assuming the audience have been paying attention! But there are so many other clever bits in this script – the way that Yana and the Doctor connect as fellow genius scientists, bouncing and riffing off each other’s brains. The Jack banter. The respectful relationship Yana has with Chantho which mirrors the Doctor and his many companions (and comes to a horrible counterpoint later). Yes! It’s like the Earth 2 versions of the Justice League! I loved Professor Yana, brilliant performance. I was actually really upset when I realised that he was a bad guy, because I completely bought him as a noble scientist, doing his best to save the world, and I thought that his relationship with Chantho was beautiful (and how cute was her speech pattern?). That’s a mark of a great actor, that I sympathised with him completely and was so invested in him – and then he is the Master and I was devastated! And, didn’t he even say, “I am so sorry,” another echo of the Doctor? The best Master stories were always the ones that showed how he and the Doctor were so similar underneath it all – a few key points of difference but ultimately they understood each other better than anyone else in the universe. You see it particularly in the Delgado/Pertwee pairing of course, but also between the Fourth Doctor and Ainley’s Master in Logopolis. Less so in the Davison years and beyond – I loved Anthony Ainley but I do wonder how beautifully Peter Davison might have riffed off a younger, more dynamic Master who was a better reflection of his own Doctor. So yes it’s very clever that Yana and the Doctor are so similar and connect so beautifully – because it sums up the tragedy of their friendship, and sets everything up for Tennant/Simm fireworks. When I realised that it was the Master I was incredibly excited. I knew he would have to make an appearance at some point in New Who. We’ve seen the Daleks and the Cybermen, after all. It is funny that you mention Roger Delgado, Tansy, because for me Anthony Ainley’s version is my definitive Master. “Your” Doctor is Three, right? It shows how where we started watching as children impacts us, I guess. My Doctor is a complicated matter – I started watching during the Great Repeats Years so didn’t really distinguish between Pertwee, Tom Baker or Davison as having precedence over each other, chronologically or otherwise. Ainley was my first Master too, and I adore him. But Pertwee is very much “my” classic Doctor now, as an adult, and I have come to appreciate Delgado’s Master quite deeply as an adult. Having said that, it’s hard to go past The Keeper of Traken, Logopolis and Castrovalva as the ultimate Master-Doctor battle, especially when you consider that the Master gets to win TWICE out of three stories, and he’s never scarier than in those stories. And I like very much that the Ainley Master in Survival is almost a reboot of the character, and that the older, more damaged version is such a good match for the Seventh Doctor with his machinations. “The Great Repeats Years” is perfect. I love it! All that recycled BBC programming shaped my childhood in a very powerful way. And, I agree completely, that arc of stories is hard to beat in terms of the Doctor/Master conflict and still stands out with crystal clear clarity in my mind as some of my favourite Doctor Who. I was absolutely crushed when Four fell from the tower, and it still has a deep emotional resonance for me, almost three decades later! Back to these episodes, sorry – I was a little disappointed that they regenerated him, I would have loved to have seen more of Derek Jacobi’s Master. I’m afraid that the my first thought with John Simm’s version was, “He is trying to out Tennant Tennant.” He didn’t really grab me at all. Whereas while I did really like Jacobi, Simm’s performance was for me quite riveting, and I thought he really brought the idea of the Master to New Who level. *Clings defensively to Simm’s Master. * I will defend to the death your right to be wrong, David, but you are SO VERY WRONG. More on this later. I really enjoyed the many ways of killing off Jack in this story. Yes, I’m STILL talking about “Utopia”. It’s done marvellously, the use of the deaths, the plot relevance of the deaths, and especially the scene where the Doctor and Jack finally get to talk. The Doctor can only open up to him emotionally when they’re separated by a glass door and Jack is about to be killed off again. And oh, he’s so harsh! The two actors have an amazing chemistry and it really shows in this scene – they go from intense to good-humoured and back again so many times. Like, you’re breaking my heart, but you still make me laugh because we have so many shared jokes … sniffle. Something I spotted this time that I didn’t on my previous watches is that Martha actually mentions The Face of Boe and his dying words in front of Jack! Which means that there is a reason for his apparently casual mention of his old nickname at the end of the story. I definitely didn’t notice that before! There are advantages to multiple rewatchings 🙂 But it kind of ruins the way that final bit works for me! Jack’s immortality is handled very well, the fact that throughout the three parter they use it as another tool is very clever. Having someone who can’t die is actually quite handy, and the Doctor is clever enough to see the possibilities. And now we’re properly on to “The Sound of Drums”, which is quite dramatically different, introducing John Simm not only as the Master, but Harold Saxon. I love the whole idea of the Master setting himself up as Prime Minister of Great Britain – it’s the sort of thing I can totally see Roger Delgado doing in the old days. 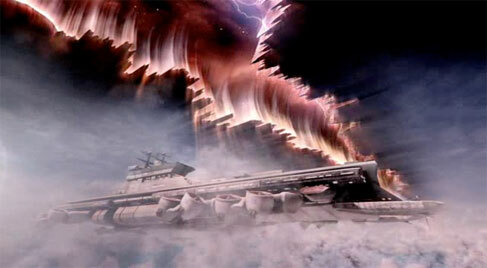 It’s not just Earth, the Doctor’s favourite planet, he’s stolen GREAT BRITAIN, the bit of it he visits most often! And oh, John Simm. I loved the brief glimpse of Derek Jacobi’s old school sinister Master, but John Simm’s batshit crazy rockstar Master is extraordinary. Unforgettable. The long scene where they talk on the phone after so long is quite electric. Even more than the Jack reunion in the previous episode – again the emotions are kept at arm’s length, the two scenes reflect each other quite well. I am afraid we might have to agree to disagree here! There were some brilliant flashes here and there, where we see how much of a psychopath the Master really is, and the contrast of his manic personality makes it quite chilling at times. But, you can go to far with it and there were a few times where it was just annoying. 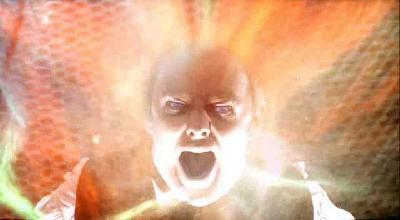 I think the music suffered from the same problem as the Master. At times, it captured the mood perfectly, and I put Voodoo Child in that category, but at others it was far too dominating. It’s more the instrumental parts that I am talking about here. Some of it is beautiful, but it should complement what is happening on screen, not overpower it (but I am talking more about the last episode here, anyway so I will stop). It’s very sweet that Jack still has his TARDIS key. The little touches in this episode are well done indeed. I love the Valiant. The whole concept of the terrestrial flying saucer, or whatever it technically is. It reminds me of the UNIT years of Doctor Who in the early ’70s when contemporary Earth was presented as slightly more futuristic as the real thing – touches like Britain having a space program, or the Prime Minister being female. I also appreciated that the Master lightly dropping the detail that he was involved with the design of it (thus has been “helping” Earth science along). Oh and can I just mention, the bit at the end where the Master suggests decimating the humans and then literally kills off one tenth of the population made me happy. Because as a Roman scholar it bugs me how often people misuse the term. The Master may be the villainously villain of them all, pure evil, but at least he knows his Latin. It made me think of the Avengers (the 2012 movie), for obvious reasons, but you are absolutely right. 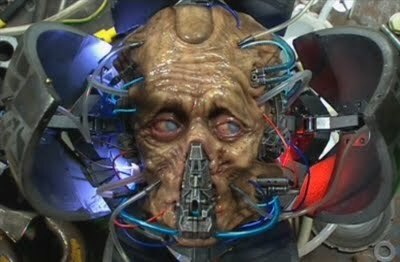 I loved the UNIT stories of Classic Who, and the way that the Doctor and the Master using their alien technology had an impact on what was happening was often a major component of those stories. Ha, my brain totally went to the other Avengers movie (Rafe Fiennes and Uma Thurman doing horrible things to my beloved Steed and Peel, let us never speak of it again) and I was all ‘but that wasn’t 2012!’ Goes to show I’ll always be a Diana Rigg fan ahead of being a comics fan, though I love both kinds of Avengers now. Yes, ‘Helicarrier’ is the perfect term for the Valiant. It also reminds me of the museum in “Dalek”. The idea that all the alien activity on Earth over the years would cause a degree of technological pollution is a compelling one. In that case you really really need to watch Torchwood, which is all about that stuff! (and possibly the Sarah Jane Adventures). Next episode, “Last of the Time Lords”! Martha has been walking for a year, and the Master and Lucy have been singing and dancing along to karaoke for the same length of time. No wonder she looks tired. I was really excited when I first saw the beginning of this episode – the idea that the world had actually changed because of the Master, and maybe we’d be dealing with the consequences for a while. But of course … reset button at the end. Aargh! People need to not be allowed to rewrite time in stories. If you go around undoing things then there is NO DRAMA! This last episode is so flawed. It has moments of awesome but, oh, I hate the old Doctor part. Kind of the equivalent of the literary device, “It was all a dream…” 🙂 And yes, LOATHE the “old” Doctor. The turning back time is what ruined the original Superman movie for me. You’re right, it should be banned, and any writer using it forced to do hard labour. And the old Doctor was a bit much for me, too. I couldn’t stop thinking of Dobby and waiting for the Master to carelessly give him an item of clothing, accidentally freeing him! Haha I do now! And fair enough, too! The reveal of what, who, the Toclafane really are is one of the high points of the final episode. Creepy, but clever and well done. You know, I really expected them to find a Dalek when they pried open the spheres? They got me there. The ending. Hmm. I dunno, second time around I’m even less sold on the resolution than I was first time. I loved that Martha is the one who saves the day (I love Martha, and she is brilliant in this episode) but the whole psychic network thing restoring the Doctor… Hmm. I’ve seen no evidence in any prior episode that this sort of thing is part of the Doctor Who universe, so it’s very convenient, very “wibbly wobbly”, for me! As an interesting aside, the iTunes version of this episode seems to be missing several very short little scenes that aren’t necessarily crucial, but certainly do add layers to the story! Poor form iTunes, poor form! The ending was a bit disappointing. I thought the idea of Martha going away and coming back to save the day had a lot of potential and should have been made more of. There is no doubt that Russell T Davies is brilliant, and every Doctor Who fan owes him an incredible debt of gratitude. But this three parter shows a lot of his flaws as a writer that I can see looking back over earlier episodes. There is a degree of silliness that sometimes gets out of control, one of the reasons I loathed the Slitheen. And, when he tries to evoke emotions he often goes over the top. If you look at episodes like “Father’s Day” or “The Girl in the Fireplace” they are intensely emotional and powerful episodes, but that emotion is done in a much more subtle way. I can see what Mr Davies is trying to do with the climactic scene where it is the world’s belief that empowers the Doctor, but it is pretty heavy handed. I was a little disappointed with the idea that Jack is the Face of Boe, especially when you think about the millions of years of degeneration he would have gone through to get to that point, but the goodbyes are examples of how emotional moments can be done right. Rose’s goodbye was sadder, though, at least Martha got to go out on her terms, but that is a little weakened by her so obviously leaving a door open. But, we can see the Doctor has matured a bit since his last goodbye, is no longer as damaged, and handles it far better. They both recognise that it is the right thing for both of them. I think we also see a “new” Jack who has, without losing all his charm, become a more responsible character with a new sense of duty, and I am much more inclined to watch Torchwood after this episode. I like that Martha gets to go without it being overwhelmingly sad – I like the new focus on characterisation and satisfying narrative arcs for the companions in New Who, but I am a Classic Who girl at heart and I really dislike the idea that it must be utterly tragic every time a companion parts company with the Doctor. I’d like to see more companions who outgrow him, or find new passions, or simply decide it’s time to stop having TARDIS adventures because there are many other kinds of adventures in the universe. Martha had such a tough gig, being the companion straight after the adored fan favourite Rose – I don’t know if either of you, coming retrospectively to the show, have any idea how HUGE Rose was to New Who fans back in 2005-6. I think on the whole it would have been nice if they had done a lot less meta discussion of how Martha measured up to Rose in the narrative of the show, and just got on with letting her be awesome. Speaking of parting ways, as we discussed at the time I was very disappointed how they almost seemed to retcon this idea of leaving the Doctor as a complete tragedy that brings your life to halt into Sarah Jane’s backstory. To me, Sarah Jane went on to be a fearless reporter (the Lois Lane of Who?) with a fulfilling life of her own, and her time with the Doctor broadened her horizons, not limited them. I don’t care what the writers of “School Reunion” think, what would they know? Perhaps it is the luxury of distance from when the series first relaunched, but I much preferred Martha as a companion to Rose. There were times when I found the dynamic between Nine and Rose almost creepy (part of that was his damaged nature, of course) and I liked the fact that, as much as any human could, Martha was much more capable of holding her own with the Doctor. Rose grew on me though, I will admit. I definitely preferred Martha too. Even though they wrote her in love with the Doctor, like Rose, she just was more mature and sensible and interesting! Freema and Martha (and to some extent the performance of John Simm as the Master) are the saving graces for me of this final, utterly flawed episodes, but they don’t make up for my disappointment at such a dud conclusion to a fabulous storyline. Sadly, this won’t be the last time that RTD falls to bits at the finishing line. Poor old Jack! I’d love to hear what you think of him as a character in Torchwood, David. I think they are able to convey a much greater sense of the historical weight to his story – and I find it fascinating how making Jack the lead character in a show subtly changes him, as compared to Doctor Who where he is always the sidekick. I’d think it would take out some of the competitiveness, if nothing else. Okay, I’m sold on Torchwood! Oh dear, how we will keep up with the DW reviews if you’re inhaling Torchwood too! *shoos David away* Go on then, get watching! This entry was posted in Geek, Pop Culture, TV and tagged New Who Conversations, Tansy Rayner Roberts, Tehani Croft Wessely on June 28, 2012 by David. My Aussie Spec Fic Snasphot 2016 roundup! My MidAmeriCon II Schedule – it’s Worldcon Time!